It’s been eight months since gray wolves were removed from the endangered species list, but some are concerned that the Park Service has not taken necessary action to close a perceived loophole in legal protections for the animals within national park lands. Specifically, they mean the potential hunting of gray wolves along the John D. Rockefeller, Jr. Memorial Parkway, which connects Yellowstone and Grand Teton National Parks. Sharon Mader, Grand Teton Program Manager with the National Parks Conservation Association, says the group wants to ensure the recently delisted wolf can find a sanctuary in a place Congress called “a spiritual connection” between Yellowstone and the Tetons. “I imagine that since a hunt has not yet been proposed that there is no feeling of urgency at the moment, however we could see a potential hunt as early as next year or several years in the future, so the time to act is now,” says Mader. Mader says that the Wyoming Game and Fish Department turned its back on the Park Service when it included both the John D. Rockefeller, Jr. Memorial Parkway and the Grand Tetons on its list of managed hunting areas. Mader says that, while the state has committed to prohibit hunting in the Tetons and hasn’t yet issued permits for the parkway, the NPCA hopes to put any ambiguity to rest. We believe the mission of the park service is much different than that of the Wyoming Game and Fish and the state of Wyoming and that is for the preservation of wildlife, so therefore a hunt is not appropriate. 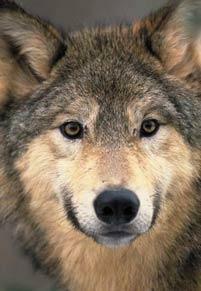 Mader says the Park Service has stated it does not want wolf-hunting on its land. Although Wyoming Game and Fish says that the state has a healthy population of wolves, some groups believe the numbers are still far below where they should be. Spokesman for the Game and Fish, Eric Keszler says that the minimum number of wolves needed to maintain a healthy population is 150, and the minimum number of breeding pairs is 15. At the end of December, there were about 21 breeding pairs in Wyoming. The National Rifle Association and Safari Club International are blaming wolves for bringing down the quality of big-game hunting in northwestern Wyoming. The hunting groups are pushing to intervene in lawsuits pending in federal courts in Washington D.C. and Wyoming. The groups want to oppose environmental groups' push to reinstate federal protections for wolves in Wyoming. 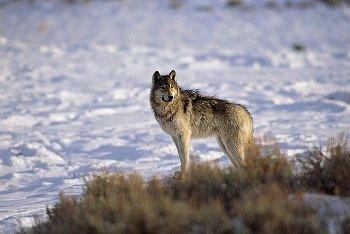 Wyoming's wolf hunting season ends today. Hunters are allowed to kill a total of 52 wolves ... but as of Friday afternoon, they had taken only 43. It's Wyoming's first wolf hunting season since the federal government reintroduced wolves to the Yellowstone ecosystem in the 1990s. Besides those taken during hunting season, 25 wolves have been killed around Wyoming this year because they were considered predators. 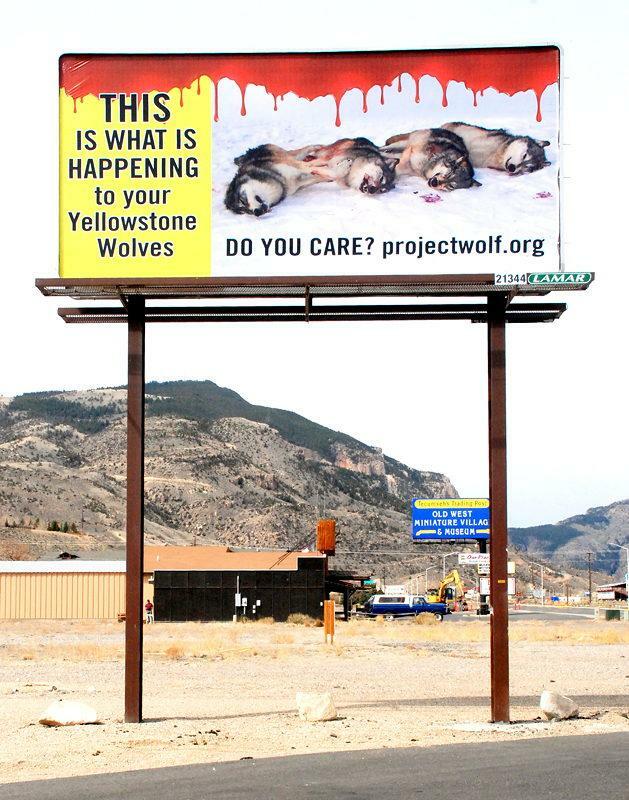 A group connected with a pro-wolf organization, projectwolf.org, erected three graphic signs along entrance routes to Yellowstone National Park.